Windows 10 offers users the possibility to reset their systems and bring the OS to its default state. By doing so, you can eliminate various bugs that may prevent their computers from working properly. 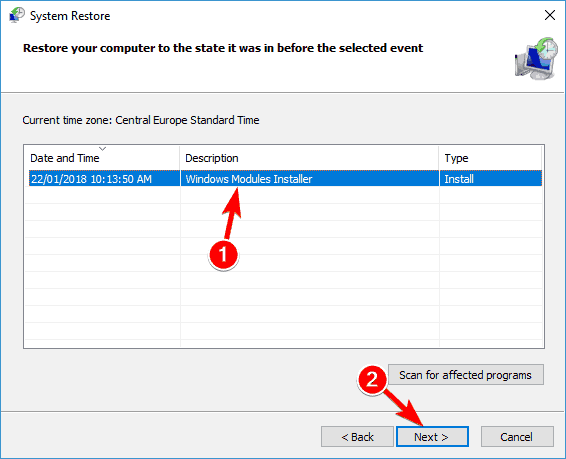 However, there are instances when resetting your Windows 10 computer turns into an impossible task due to the error message: “There Was A Problem Resetting Your PC. No Changes Were Made“. In this article, we’re going to show you how to fix this error. There was a problem resetting your PC no changes were made Windows 10, Windows 8 – This issue can affect both Windows 10 and Windows 8. Even if you don’t use Windows 10, you should be able to apply most of our solutions to Windows 8 as well. There was a problem refreshing your PC, no changes were made – This is just a variation of this error message. If you encounter it, try running SFC and DISM scan and check if that solves the problem. 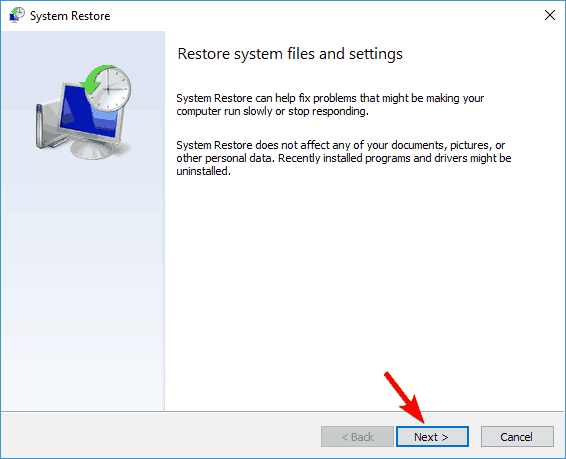 Can’t reset PC Windows 10 – This is a variation of the original error that you can encounter. If you notice this problem, try performing System Restore and check if that helps. There was a problem resetting your PC Surface Pro 4, Surface Pro 2, HP Stream, Dell, Lenovo – Sometimes this error message can appear on your laptop. It seems that all laptop brands can be affected by this problem, and in order to fix it, you might have to run DISM and SFC scans outside of Windows. There was a problem resetting your laptop, computer – This issue can affect any device, both laptop and desktop. If you have this problem, be sure to try some of our solutions and check if that works for you. Press Windows Key + X to open Win + X menu. Now select Command Prompt (Admin) from the list. If this option isn’t available, you can also use PowerShell (Admin). When Command Prompt opens, enter sfc /scannow. SFC scan will now start. This process can take up to 20 minutes so don’t interrupt it. If SFC scan doesn’t solve the issue, or if you can’t run SFC, you might have to use DISM scan. To do that, just start Command Prompt as administrator and run DISM /Online /Cleanup-Image /RestoreHealth command. Keep in mind that DISM scan can take more than 20 minutes, so don’t interrupt it. Get the Windows 10 install files from the Microsoft website to create a boot-up CD or USB stick. For a step-by-step guide, check out our article on how to create a bootable USB Stick with Windows 10. Plug the USB stick in or insert the CD and then choose Reset. Press Windows Key + S and enter system restore. 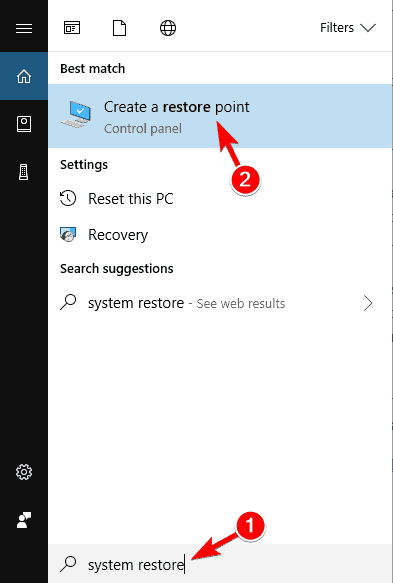 Choose Create a restore point from the menu. System Properties window will now appear. Click on System Restore. Once System Restore window opens, click Next. If available, check Show more restore points options. Now select the desired restore point and click Next. Once your system is restored, the issue should be completely resolved. 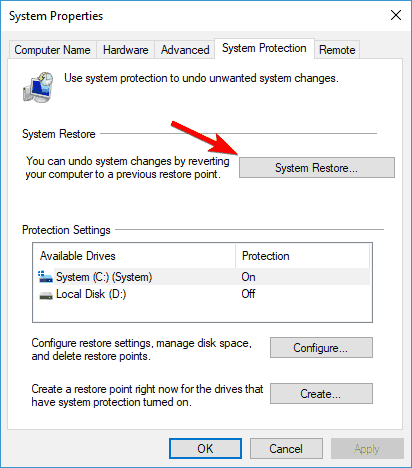 If no restore points are available, go to the Control Panel, search for Recovery, select Recovery, go to Configure System Restore and then select Configure and Turn on system protection to enable this option. After running these commands, try to reset your PC again. 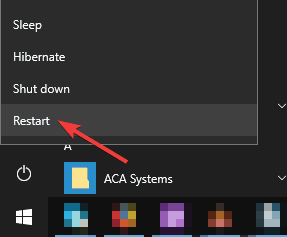 Open the Start Menu and click the Power button. Press and hold the Shift key and choose Restart from the menu. List of options will appear. Go to Troubleshoot > Advanced options > Command Prompt. Now run the wmic logicaldisk get deviceid, volumename, description command. List of local drives will appear. Find your system drive. Keep in mind that this is usually D outside of Windows environment. Now enter the following command: sfc /scannow /offbootdir=d: /offwindir=d:Windows. Once again, the system drive might not be D on your PC, but in most cases it is. SFC scan will now start, so be patient and let it finish. Once the scan is completed, check if the problem still persists. Boot your PC from the installation media. Now click Repair your computer option in the bottom left corner. Now choose Troubleshoot > Advanced options > Command Prompt. Enter dism /get-wiminf /wimfile:E:sourcesinstall.esd command. You should now see all system images available on the installation media. If you don’t see this information, try using a different letter instead of E: to access the system image. Now run dism /image:d /cleanup-image /restorehealth /source:esd:e:sourcesinstall.esd:2 /scratchdir:d:scratch /limitaccess command. If everything is in order, DISM scan should now start and repair your files. Once the scan is finished, check if the problem still persists. Keep in mind that this is an advanced solution, so be extra cautious and follow the instructions carefully. Now choose Windows Defender. Click the Open Windows Defender Security Center button. Now go to Device performance & health. Click Additional info in Fresh start section. Now click Get started button. Follow the instructions on the screen to refresh your PC. Keep in mind that by refreshing your PC you’ll remove most files from the system drive, so be sure to back them up. 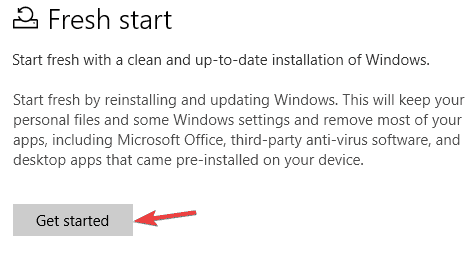 If you keep getting There was a problem resetting your PC error message, your only solution might be to perform a clean install. To do that, you need to create an installation media with Media Creation Tool. After doing that, boot your PC from the installation media and select your system drive. Follow the instructions to complete the installation. 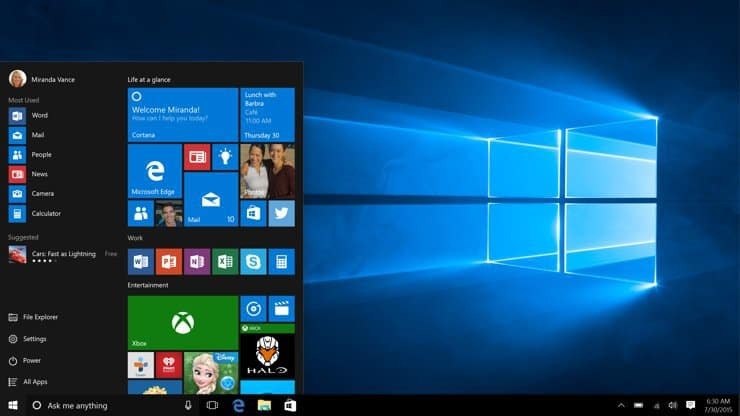 Once the installation is finished, you’ll have a clean installation of Windows 10 and the problem should be resolved. If you need to back up your files, be sure to look for Windows.old directory and restore the desired files. There you go, we hope one of these solutions helped you to complete the reset process. If you’ve come across other workarounds, list the troubleshooting steps in the comment section below. 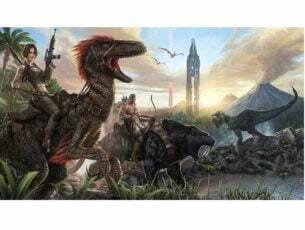 Editor’s Note: This post was originally published in February 2017 and has been since completely revamped and updated for freshness, accuracy, and comprehensiveness.